Long time, no DIY Tutorial! Let’s keep this quick and brief: Read ahead to create your own seashell crown. 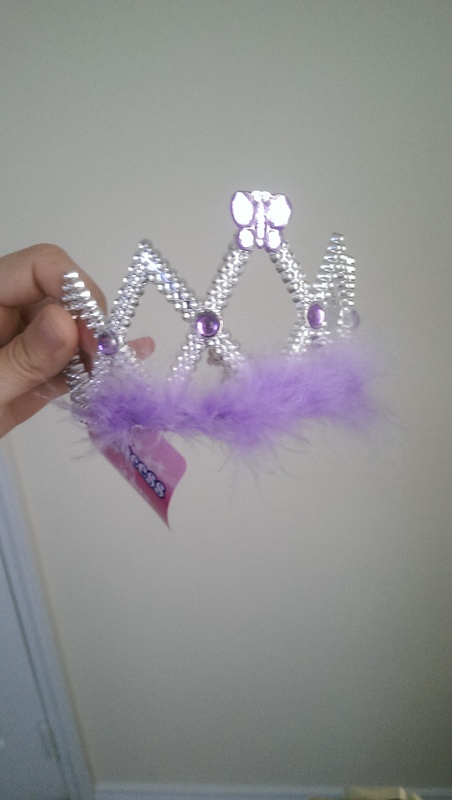 Prep Phase: The purple tiara I purchased only cost a buck at the Dollar Tree. I easily removed the feathers glued in a strip along the edge of the crown. Allow a few minutes for the gun to heat up. Side Note–This step was especially exciting for me, because I finally purchased a new glue gun!! After borrowing my dad’s for years and accidentally sabotaging the tool last week (which by the way, don’t ever stick a mini glue stick in a regular sized glue gun. You’ll never get it out. 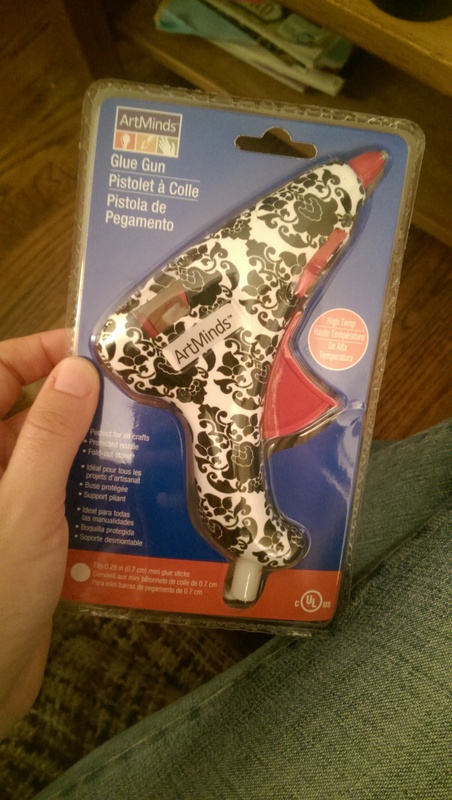 ), I broke down and bought a pretty new glue gun. The minis only costs $5 at Michael’s. Note: I ended up NOT using the Glitter Glue, but it could prove useful for those of you that go for the optional glitter phase. 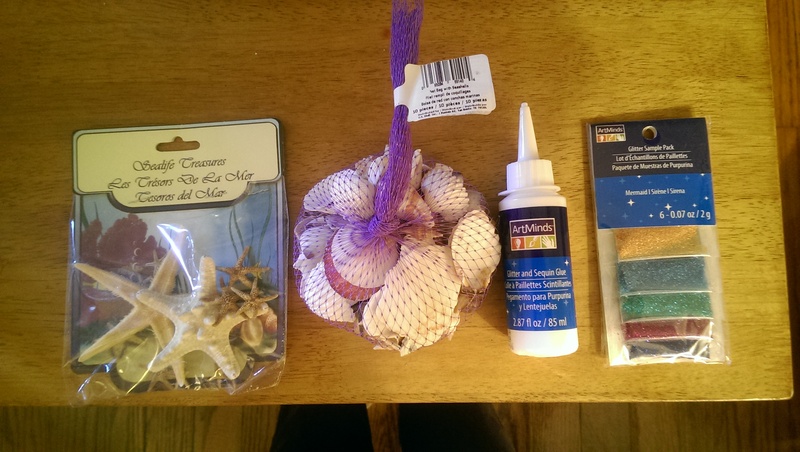 Take a few moments to decide where you want to place the best looking seashells. 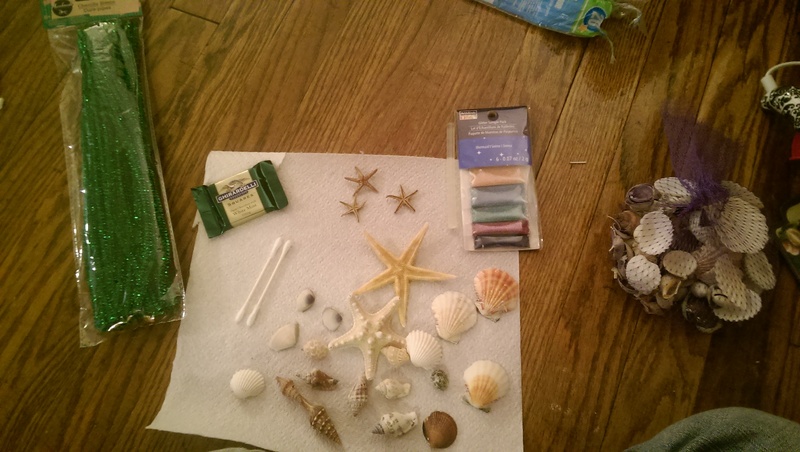 I purchased 2 packs: One with a few large starfish and the other held a variety of mini seashells. With clear, hot glue, I rarely shy away from using copious amounts to secure my projects. This crown is no different. So get crazy with it and use as much glue as you need! I started with placing the 2 large starfish in the front, then worked my way towards the sides of the tiara by meticulously adding whatever seashells I deemed fit. To fill in gaps, I carefully placed the seashells on top of each other. Feel it out and determine what look works best for you. The best part about this project is making the crown appear however you like. It’s so easy to make and cheap! This step remains optional, because it’s truly up to you. If you prefer a more “natural” appearance, leave the glitter off. If you want to add shimmer to match the mermaid tail, Jade Green Glitter or Gold will make the crown “pop”. You could easily secure a green, glittery pipe cleaner to the base of the tiara to match the rest of your costume. I haven’t tried this yet, but I might depending on how it looks with the skirt once it’s all put together. And that’s a wrap! If you choose to try this project, please let me know how it turns out!! That sounds exciting! Who was there? Thanks. This is so beautiful. Love this.